1. Operationally, the strike showed the U.S. has the capacity to conduct airstrikes with allies, against significant targets, with minimal lead time. It took less than a week for the U.S. and its allies to organize and position the air and naval platforms they used to carry out the missile assault. Indeed, according to the Wall Street Journal, Secretary of Defense James Mattis delayed the strikes twice, despite operational readiness. This demonstration of operational speed and competence tells us two things. First, President Donald Trump is respected by U.S. allies. French President Emmanuel Macron and British Prime Minister Theresa May trusted Trump’s seriousness of purpose enough to join him in launching the missile strikes with little to no diplomatic jockeying. In 2013, when then-president Barack Obama geared up to attack Syrian regime targets after Syrian President Bashar Assad killed 1,400 people in a sarin gas attack on East Ghouta, the British parliament refused to authorize British forces to participate in the planned strike. The French, for their part, were left in a lurch by Obama. French bomber pilots were in their cockpits waiting to take off when they were informed that Obama had called off the airstrikes at the last minute. In addition, Saturday’s strike showed that the U.S. has the capacity to degrade and destroy high value targets through indirect fire. U.S. pilots did not have to fly over their targets to bomb them. By the same token, if it chooses to do so, the U.S. can destroy the vast majority of Iran’s nuclear installations from a safe distance with Tomahawk and other precision guided weapons. 2. The operational success of the missile strike does not infer either tactical or strategic gains. At the same time, the advance warning the U.S. provided the Syrians regarding the impending strike gave the Syrians the opportunity to remove significant assets and manpower from bases and installations before they were attacked. As a consequence, high value materials and personnel were probably not at the installations when they were attacked on Saturday morning. Haley said on CBS News’ Face the Nation that the U.S. was not interested in “killing anyone” in the attack. That is fine in and of itself. But by providing advance warning of the impending strike, the U.S. diminished the tactical losses that Syria incurred. This is doubly true given that according to Mattis and Marine General James Dunford, the Chairman of the Joint Chiefs of Staff, the installations attacked were engaged in developing sarin gas. To date, the U.S. and its allies have said that they lack conclusive evidence that the April 7 chemical attack involved sarin. According to Mattis, they have only been able to determine conclusively that the Assad regime used chlorine gas in the attack. In other words, Syria’s ability to carry out further chlorine attacks was apparently not diminished on Saturday morning. 3. From a strategic perspective, it is difficult to know whether the strike was meaningful, largely because the Trump administration has given contradictory statements about its actual goals in Syria. Officially, the Trump administration’s goal in Syria is the same goal that the Obama administration articulated: defeating the “Islamic State,” or ISIS. Mattis has been assiduous in opposing the expansion of that strategic goal. His insistence on preserving Obama’s strategy in place in Syria has confounded observers, who note that the purpose of Obama’s campaign against Islamic State was to protect the Assad regime to placate Iran in the hopes of developing a strategic alliance with Teheran. Obama’s keenness to align U.S. policy with Iranian interests made him blind to the threat that Teheran’s expansionism and nuclear proliferation constituted to the U.S. and its allies. But then, it isn’t clear the degree to which Mattis speaks for President Trump. With former Secretary of State Rex Tillerson gone, the Journal report claimed that Mattis was the lone voice calling for the U.S. to take no strategically significant action. Haley, along with new National Security Advisor John Bolton and Acting Secretary of State John Sullivan, all supported a more expansive effort. Haley added, “The president has asked the allies to step up and do more when it comes to Syria.” Apparently, they are. On Saturday night, the Syrian media reported loud explosions at an Iranian base south of Aleppo. According to reports – which were contradictory – unidentified aircraft executed the strike. Some reports alleged that the aircraft were Israeli. If Israel did strike the Iranian base, it would be the second Iranian position Israel has been accused of bombing in the past week. 4. 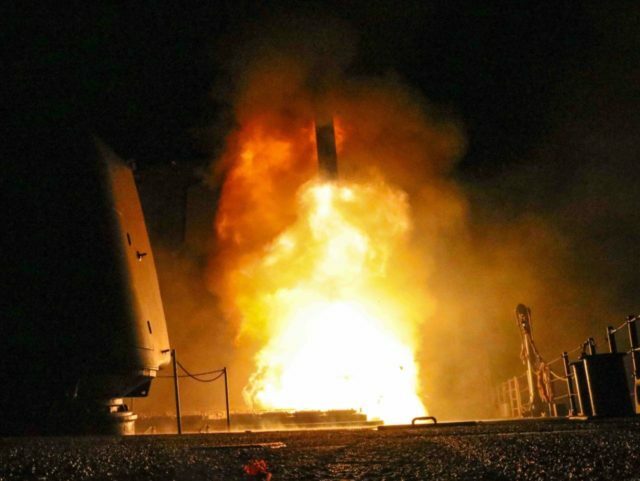 The U.S.-led attack signaled that at least for now, the U.S. has made its peace with Russian power in Syria and the wider Mediterranean basin. Mattis succeeded in blocking any action against Russian interests in Syria. As Dunford noted, the Pentagon was in close contact with the Russians to ensure that there was no conflict between U.S. and Russian forces in Syria. Mattis’s explicitly stated concern with avoiding conflict with Russia indicated that at least as far as the Pentagon is concerned, the U.S. must not challenge Russia’s entrenchment in Syria. Regardless of the actual policy adopted regarding Russia, objectively, Russia’s presence in Syria is a problem for the U.S. for three main reasons. First, Russia views its deployment in Syria first and foremost as a means to restore Russia’s superpower status by challenging U.S. power. In other words, Russia’s main goal in Syria is to weaken the U.S.
Second, U.S. allies Israel and Saudi Arabia are no match for Russia. So long as Russia remains in Syria, it facilitates and protects Iran’s entrenchment in the country. Since neither Israel nor Saudi Arabia can contend with Russia, they cannot prevent Iran from effectively taking over the country both directly and through its Syrian and Hezbollah proxies. In other words, dealing with Russia is a job the U.S. cannot subcontract to its regional allies and they cannot achieve their regional goals so long as Russia remains unchallenged. Finally, the Russian presence in Syria is a problem for the U.S. because it expands Russia’s influence over Turkey at America’s expense. It is true that Turkey has not been a credible U.S. ally for several years. But it is also true that the more Putin pushes Turkey away from the U.S., the more damage the U.S. will suffer to its strategic interests in the region. It remains to be seen how those sanctions will impact Putin’s cost-benefit analysis. But it is hard to see that sanctions, however harsh, will outweigh what Putin perceives as the benefits of maintaining Russia’s presence in Syria.